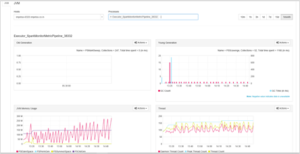 Monitoring aspect of StreamAnalytix allows you to monitor the performance of running Pipelines and System Health of all the cluster machines through interactive graphs. For example, monitoring memory usage and hard disk usage of pipelines. The Time view feature can be used to view the graphs for selected duration. For example, for 10m (10 minutes), 1h (1 hour), 3h (3 hours), 1d (1 day) , 7d (7 days), 15d (15 days) and 1 month. Default Time view is 10 minutes. Auto refresh display interval can be set in seconds or minutes to view the updated data. You can also generate alerts to be notified when the performance drops. You can monitor a deployed pipeline from the pipeline card on the Data Pipeline page. You can monitor the performance of your application pipeline components inside the StreamAnalytix Monitoring Module. Cluster Monitoring provides information on the JVM metrics of the host machines. JVM graphs allows you to monitor the JVM metrics for various processes running on various hosts. StreamAnalytix allows you to create alerts to be notified on System or Application Events. Alerts facilitates you to be notified every time the given criteria for an alert is satisfied. 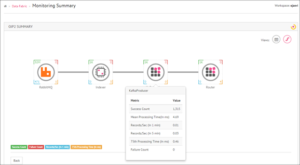 Application Alerts: Shows the alerts applied on the data pipeline using Alert processor. System Alerts: Shows the alerts applied on Data Pipeline Monitoring for its components, System Health Metrics of CPU, and system error.